November is National Diabetes Awareness Month, a time of the year where organizations help to bring awareness to diabetes. When loved one has been diagnosed with diabetes, it can be a confusing time for everyone involved. It is important to remember that with proper management, a person with diabetes can live a long, healthy, and full life, even if they need the assistance of an in-home caregiver. In order to help raise awareness about diabetes, we’d like to take a few minutes to reveal the truth behind some of the biggest diabetes myths we have heard. There are several types of diabetes, but the most common form is type 2, which usually occurs later in life as a result of the body not producing the correct levels of insulin. About 29 million Americans have type 2 diabetes, and it is estimated that about 8 million people probably have diabetes but are undiagnosed. Myth: Only obese people get diabetes, or, all obese people will develop diabetes. Both of the above statements are myths, though most myths have a bit of truth in them. Being overweight is a contributing risk factor for type 2 diabetes, but a history of diabetes in your family, ethnicity, and poor diet also play a huge role. Conversely, many healthy-weight people will develop diabetes in their lifetime. Myth: Diabetes isn’t a big deal; or on the other hand, diabetes is a death sentence. If diabetes is left untreated, it can lead to severe complications including loss of limbs, vision, heart attacks, and other serious ailments. However, it is important to remember that a diabetes diagnosis is not a “death sentence,” and that with proper management, a person with diabetes can live a long, healthy, and full life. Myth: People with diabetes can’t have dessert. This is one of the most misunderstood aspects of diabetes. People with diabetes can indulge in sugar, sweets, and desserts just like anyone else. However, a balanced diet is key. Occasionally having a sweet treat with an otherwise balanced diet should be just fine. And at the end of the day, no one has perfect glucose levels all of the time. Most people with diabetes and their caretakers understand their limits and tolerance for sugar, and how it will affect them, but avoiding eating sweets on an empty stomach can help unsafe spikes in blood sugar. Myth: People with diabetes can’t exercise. While low blood sugar can be associated with physical exercise, this doesn’t mean someone living with diabetes can’t exercise. As with most of these myths, it’s all about balance. Finding balance between insulin intake, exercise, and diet is all vital to live a healthy life. Your physician can help determine the best way to achieve this. About one in four adults over the age of 65 have diabetes. Those living with diabetes, especially the elderly, can sometimes need assistance managing it, sometimes full-time. 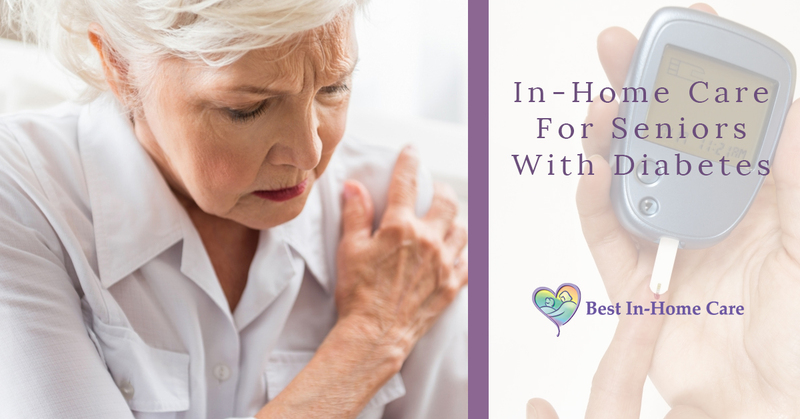 If you have a loved one living with diabetes who is struggling to manage it, contact Best In-Home Care in Lubbock, Texas. Our in-home caregivers can help individuals prepare healthy, nutritious meals, manage blood sugar levels, administer insulin and other medications, and even help run errands or go to doctor’s appointments. Contact Best In-Home Care in Lubbock today to find out if your loved one could benefit from in home care for seniors with diabetes.